I like broccoli-cheese soup. 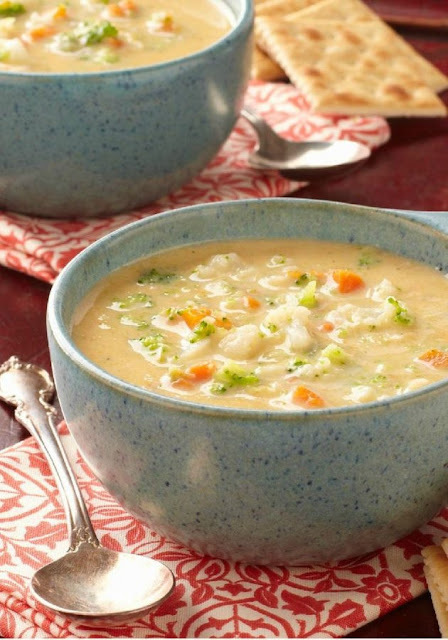 Therefore, I am going out on a limb to assume this vegetable-cheese soup from Kraft via BlogsRelease will be tasty as well. It has broth, Velveeta cheese, broccoli, and carrots. Seems like a winner to me. BRING vegetables and broth to boil in large covered saucepan on medium-high heat. Simmer on low heat 10 min. or until vegetables are tender. Remove from heat. MASH vegetables to desired consistency. STIR in VELVEETA; cook 5 min. or until VELVEETA is completely melted and soup is heated through, stirring frequently. Save 40 calories and 5g of fat per serving by preparing with 2% Milk VELVEETA. For a smooth consistency, soup can be pureed in a blender, food processor, or directly in the pan with a hand or immersion blender. I am thinking the soup base of this would be good for an ultimate potato soup. Add some cubed potatoes and seasoning. Then garnish in individual bowls with crumbled (cooked) bacon, chives, and a dollop of sour cream.